With Tropical Storm Barry situated southwest of Tampa, we greet June 1st with much needed rain. On this, the first day of the hurricane season, my rendition of the "Springtime in Paris" sock has been cast off. I finished the last few stitches sitting and gazing out on a gray sky and much needed precipitation. 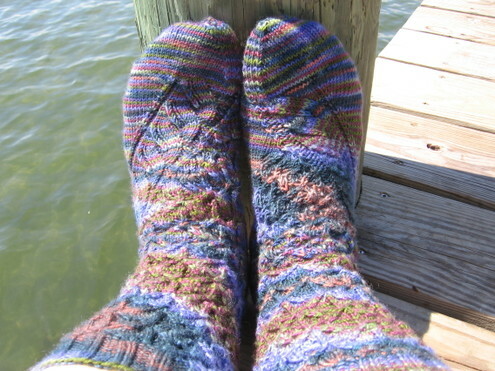 I had the first sock knit and took sock two on a fabulous trip to Hawaii. Alas, had I read the instructions more closely I would have understood that only one sock was to be knit. My partner was to knit the mate. The yarn is from the fabulous dyers at Blue Moon Fiber Arts. This is the Downpour color-way. These pair are heading to the press for blocking and then shipped off to Louisiana and onto the waiting feet of my Hurricane Swap partner, Jill. I hope that she enjoys them as much as I enjoyed knitting them. Here is a close up of the pattern. see the little Eiffel Towers? Where can you find this little pattern, you ask? Why, join my favorite KAL "Six-Sox Knitalong". The new pattern was posted today. By the way, this was my first attempt at "toe-up." Très bon! A little segue. I just want to share my favorite summer slurp with you. 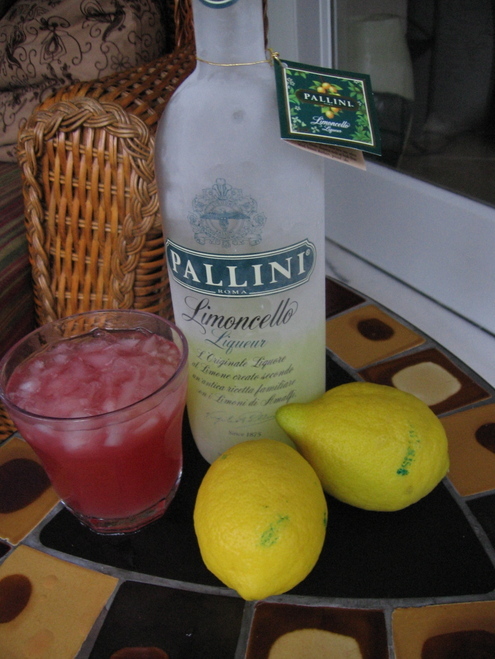 Limoncello with a splash of cranberry juice. You can find this lemony delight on the cordial shelf of your favorite liquor vendor. For those of you, self- employed and who pay quarterly taxes, the trepidation of the annual tax return familiar. 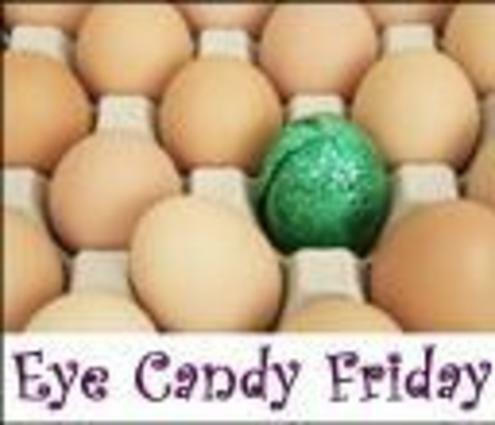 This was my eye candy for today, Friday the 13th. A refund is something that I haven’t seen in years! 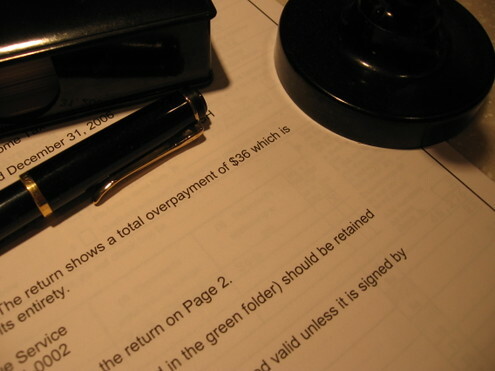 Usually I am the one writing the check along with the estimated taxes for the following year. Happy Tax Day Eve all. Ahh, the last day of Spring Break for the youth. Me, I treated myself to a day of decadence. A stroll around the garden, the house to myself, the scent of orange blossoms wafting into the bedroom window, uninterrupted DVD's on the porch during a light rain shower, completed Lenten Rose socks, and an hour long massage in the afternoon. 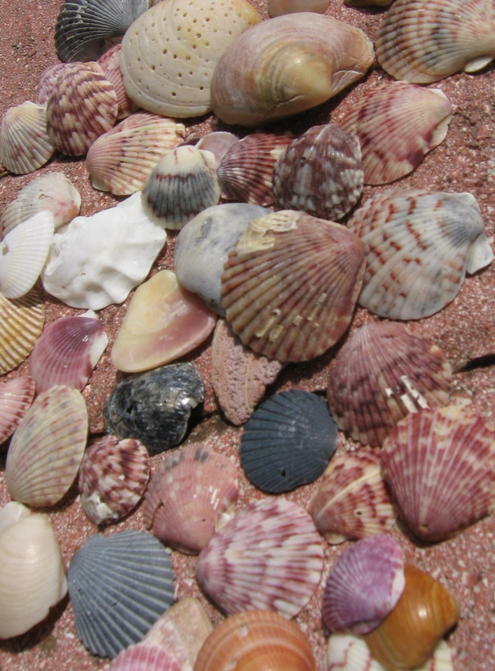 Erik's shell collection from his day at the beach. 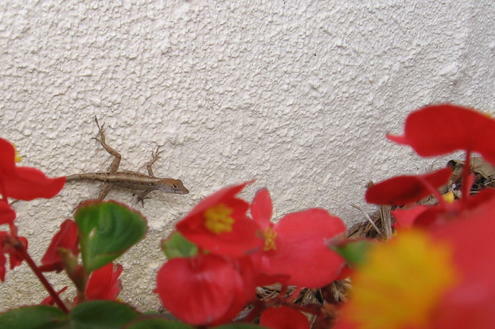 A lizard in the sun. 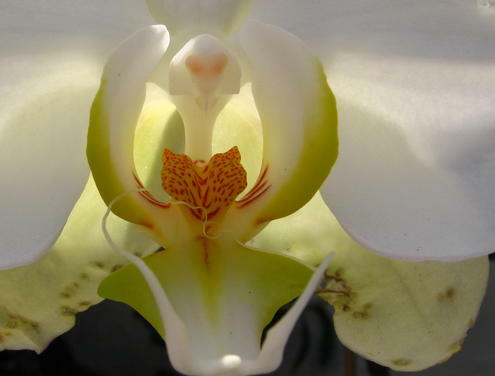 A pair of orchids in bloom. I tell you what; the fun never ends here in my little corner. Enough with the bad haiku, my electronic angst continues with a Nano that will also be put to rest along with my Dell. Perhaps I should buy my electronics in happier colors. On a more cheerful note, my hero at the computer shop a few doors down was able to cobble together a working desktop using parts from the Dell, a new hard drive, DVD/CD burner and some extra memory and my sons CPU. I am operational and that makes me happy. In the spirit of black, here are pair socks for your viewing pleasure. This pattern can be found here. Look for the Horcrux socks. 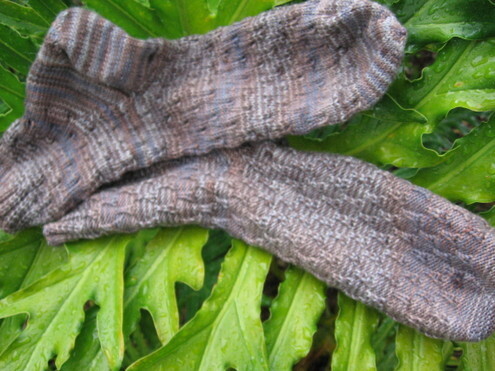 I have knit several of Susan’s socks, always a pleasure. The yarn is Debbie Bliss Cashmerino Aran in, what else, black! Connie stitched the roses onto the heels using silk ribbon, a nice touch, don’t you think? She was also kind enough to stand on the railroad track behind the shop and model. There are some new projects on the needles, but I will save these for another post. My little corner of Florida has been experiencing robin’s egg blue skies, balmy breezes and lots of sunshine. 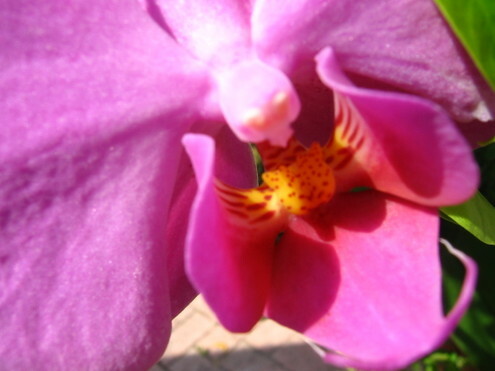 Every plant has new growth and the azalea, camellia and bougainvillea are in full bloom. The weather is conducive to spending the day on the beach, in the garden, just anywhere but in the office. I took the opportunity to grab lunch at one of the last remaining drive-in restaurants, the Moonlite Drive-In. They have been in operation since the late 50’s and still a family business. 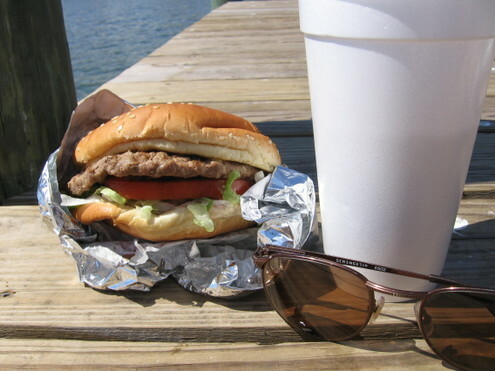 When I get the urge for a burger, that’s where I go! 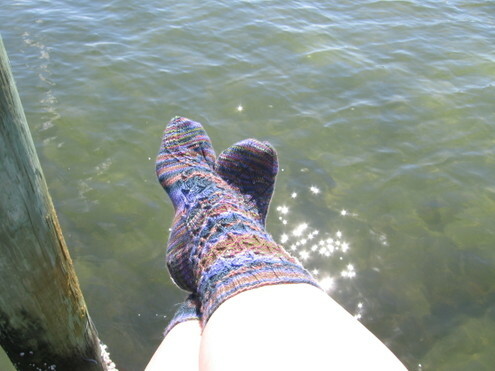 Yesterday I took my completed Tatiana socks, left sock blocked and the right sock fresh off the needles, along with a burger and a Coke to the pier and enjoyed the sun sparkling on the water. Getting to the point, my socks are finally finished. They were a challenging knit and I had to buy a set of Susan Bates aluminum needles to avoid the constant breakage that occurred when I was using the Clover bamboo DPN’s. I managed to mangle all the aluminum needles after endless K3t’s. 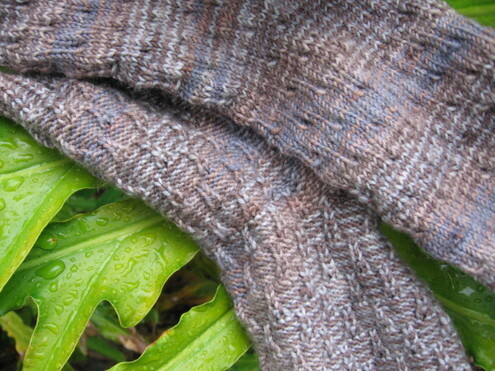 Next up for completion will be the Lenten Rose sock, then on to the Marble Arches, another kit from Blue Moon. 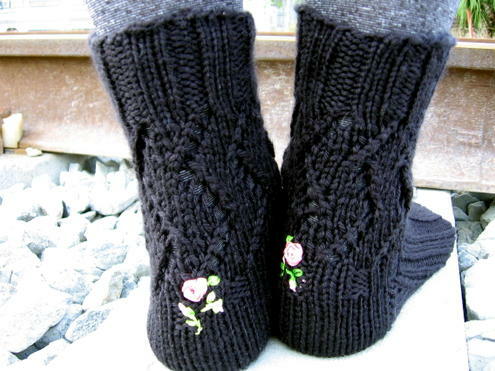 I have just one more Blue Moon kit to knit to complete the 2006 socks. I am looking forward to getting a grip on all these sock kits before I drown in yarn…what a pleasant way to go! I am entertaining the thought of a little contest with the prize being a skein of Blue Moon Socks That Rock yarn from my growing stash. What do you think? Eye Candy these days is a package on my bench to greet me when I get home. 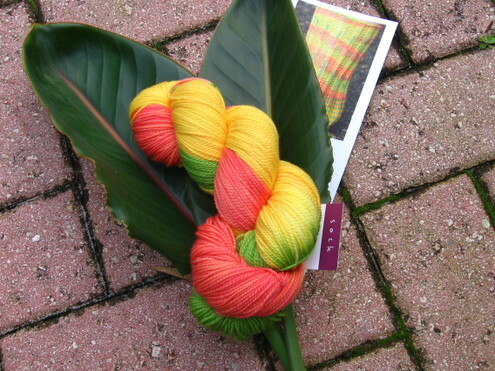 This is the Sundara sock yarn for February, Bird of Paradise. Very Florida. The Socks that Rock package should be hot on its heels. ...a sweet family of raccoons. I have driven by this tree for years. 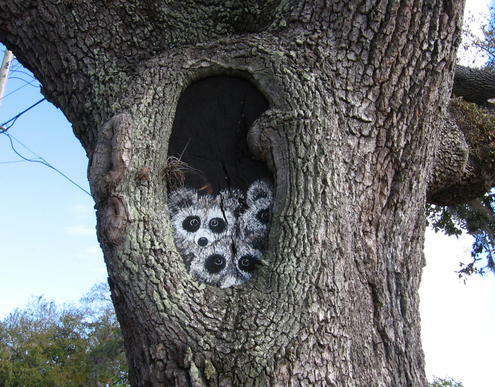 It took my taking a right and using this little side street before I ever noticed that someone painted a furry family into the knot of the oak. The corner that it lives on had old single wide trailers on it. All but the remains of this trailer are gone. 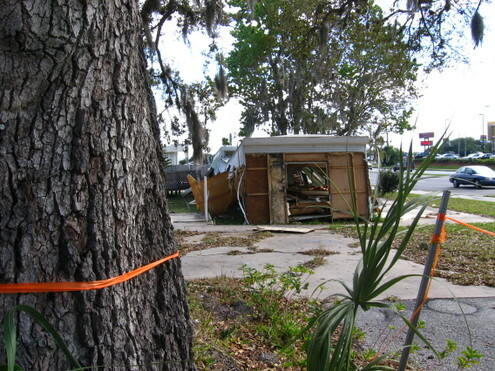 The tree remains with a ribbon of bright orange tape to designate it as off limits to the bulldozer, or so I hope. Our charming town, slow to grow, has been discovered by the developers and many things changing...not all progress is good. I did a little shopping and will share my treasures with you tomorrow. Tonight the temperature is threatening to dip into the 20’s, disastrous to our plants. The most sensitive are all covered by sheets. Our fireplace is blazing and I’m listening to the boy’s wheel and deal around the Monopoly board. I am heading back to the love seat in front of the fire to knit on the Lenten Rose. 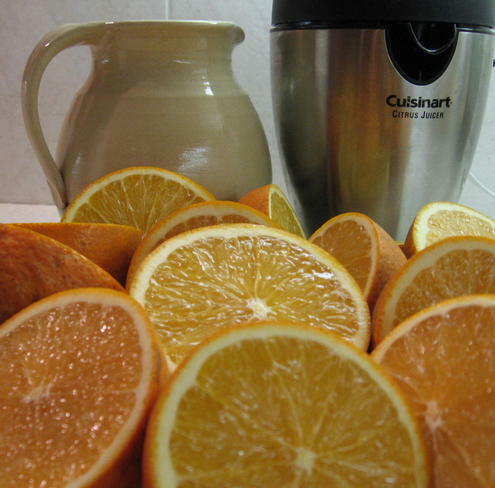 Here are the last of the Valencia’s off the tree. They gave their lives to a good cause...Cranberry Raisin Bread and a couple of wonderful Screwdrivers. Hold the umbrellas.